Although some might have different experiences, from my view in North London, I perceive that books like the Da Vinci Code are making catastrophic inroads in undermining the authentic Christian faith of countless people. 1) Seeing how ordinary people react to the book. 2) Seeing how many similar books are on the shelves of book shop chains. 3) Reading various books,articles and viewing appropriate websites. Dr Jones' doctoral research was in Gnostic literature. I feel he has a depth of understanding of this subject and the necessary pedagogical competency to counteract the above trends if the book described below is sufficiently widely disseminated. 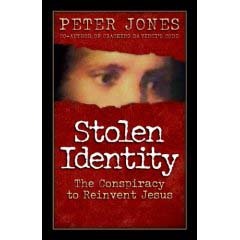 Stolen Identity - The Conspiracy to Reinvent Jesus by Peter Jones. Published 2006, by Victor, Colorado, U.S.A.
Is he the Gnostic Jesus - mystical and enlightened man - a mysterious sage whose teachings live on beyond the historical human? Or is he the biblical Jesus - both human and divine - a saviour who today can be known personally? Gnostics claim the Christian church stole the true identity of Jesus, conspiring to make the mere man into a God: while Christians hold that the Gnostics have long been trying to reinvent Jesus as a pagan prophet, denying his claims to divinity. Can we really know which of these radical views is true? In Stolen Identity, Dr Peter Jones thoroughly and accessibly investigates both Gnostic and biblical claims, comparing each Jesus' understanding of God, of his own humanity, his divinity, his spirituality, his view of sexuality, and his purpose for being in the World. Dr. Jones objectively provides complete perspectives of both views so that you will have the evidence you need to decide for yourself - the true identity of Jesus. "By being aware of the struggle the Christian church has waged throughout her history in knowing the true Jesus, today we can more effectively understand and answer the postmodern confusion over the identity of the 'historical Jesus."